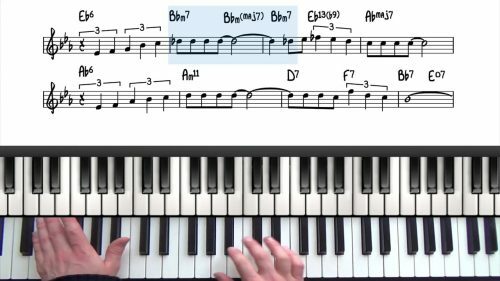 Most commonly played in Eb Major, ‘I Fall in Love To Easily’ has a very short form at just 16 measures. That being said, those 16 measures are packed full of chord changes with at least 2 chords in every bar. The Chet Baker version from 1954 is a classic recording of this tune. Bill Evans & Miles Davis have also both recorded versions that are worth listening to. Also check out the Keith Jarrett and Brad Mehldau arrangements for a more contemporary sound. You can find more information on these recordings in the recommended listening section below. 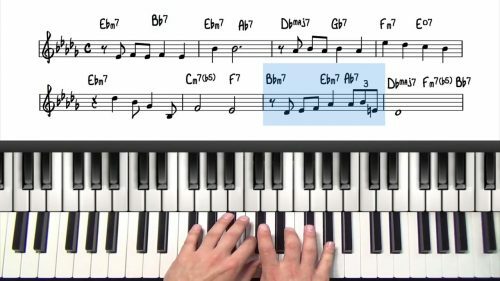 The tune contains a number of minor 25s and also a fair amount of altered harmony which can make the chord changes tricky to navigate in places. 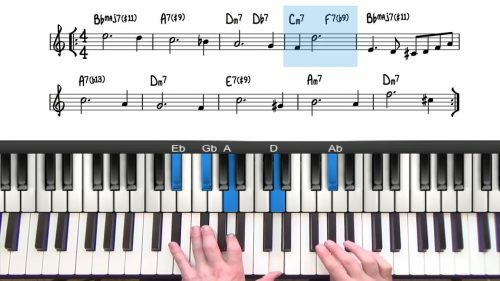 We going to start off by playing through with left hand voicings and the melody and then repeat the tune adding in some interesting chord inversions and substitutions.